Meredith Honeycutt was 10 years old when she began her very first job, working with her older sister and brother in the baby-sitting service they launched together. “I’ve been working ever since,” according to the Houston native, who says her first “real job” was with Burger King, where she rose to manager before going off to study English at Stephen F. Austin State University in Nacogdoches, Texas. Retiring in June after 24 years with Emory, Honeycutt leaves her position as business manager in the Finance Center for Campus Life, where she handled accounts for Emory’s Student Government Association (SGA). It was her first job when she joined Campus Life 22 years ago, following 18 months in accounts payable for the university. Honeycutt has seen many changes over the years and embraced more than a few challenges. The biggest one is familiar to her colleagues throughout the university — keeping up with the rapid advances in information technology and accounting systems. “When I started, we had about 300 student organizations and now there are over 500,” says Honeycutt, who provided financial support for those organizations and their more than 700 SmartKey accounts. Bridget Guernsey Riordan, who was assistant dean for Campus Life and director of student activities in April 1995 when she hired Honeycutt, was soon impressed. According to Honeycutt, she has enjoyed her position and its challenges. “My most satisfying accomplishment has been advocating for student finance with the university’s finance department as it became clear over the years that students handle finance much differently than the rest of the university,” she says. As a result, the university assigned a liaison to make sure it was meeting students’ financial management needs. “The best part of my job has always been working with Emory students, and they’ve kept me young,” Honeycutt says. One of those students was Jeremy T. Berry 97C 03L. As SGA vice president when Honeycutt joined Campus Life, he worked closely with her. “Meredith was always like family to us, the students, and everyone with whom she worked. She always had a ‘can do’ attitude and a huge smile that were infectious,” says Berry, who was appointed city attorney for Atlanta in April 2017. “Her knowledge of the budgeting process and navigating through Emory accounting were invaluable. We are all better off because of Meredith's service and the generation of leaders with whom she worked and befriended," he says. Serving Emory and its students is something of a family tradition for Honeycutt. She came to Atlanta with her two then-teenage daughters because her older sister was here. 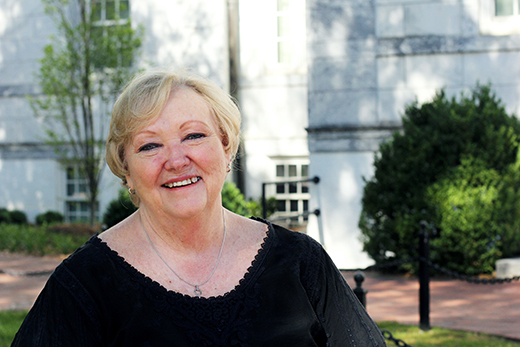 Melissa Wade, an Emory alumna, retired in 2015 after 43 years with the university, serving most of that time with the Barkley Forum Center for Debate Education, a unit of Campus Life. Honeycutt plans to begin her retirement with relocation back to Houston to enjoy more time with her family there. She previewed that return by attending her oldest granddaughter’s high school graduation in May. She looks forward also to re-engaging with volunteer work in the Baptist church where she grew up, leading Bible studies, among other roles. Traveling also figures into her retirement goals. Honeycutt has already visited Alaska, Cayman Islands, England, Scotland and Singapore — and is plotting a course to expand that list in the years to come. Perhaps on some of those long flights, she will catch up on another of her passions: reading murder mysteries. If Honeycutt makes such a commitment after retirement, few who know her will be surprised. Service to students seems to run in the family. As mentioned, her sister spent four decades with Emory. Their mother taught in the public schools of Texas for 40 years and at a church school for another 10. Honeycutt’s supervisor, senior financial analyst Roland C. Witter, her legacy of service to the university and its students when he announced her retirement.